Like most mums, I come under a lot of pressure from my small son to buy more of the things he thinks he likes, that his friends are having, but that are, to me, just empty nutrition. Almost all cereals aimed at young children have a high sugar content. Jamie Oliver’s campaign in recent years uncovered the hidden story behind poor school dinners and how they affect how children feel during the school day. Thankfully, my son’s school serves well cooked, nutritious food at midday but I feel that, if I gave in and allowed him to have some of these other things, he would get a huge sugar rush first thing, and then crash later in the morning, hungry and irritable, and this would affect his learning. I feel quite strongly about this but I get a lot of pressure from elsewhere too, to let my son eat what he likes. I get the impression that I am seen in some quarters as a killjoy or a spoilsport. but I feel very strongly that good nutrition will help my son at school. He’s a bright spark, I don’t want to waste that by giving him poor food choices, so we save the chocolately, high sugar stuff and other junky things for parties and the weekends. So I was very interested to hear about Save the Children’s Food for Thought report into childhood nutrition. Have a look at the banner at the top of this post – it makes for uncomfortable reading. 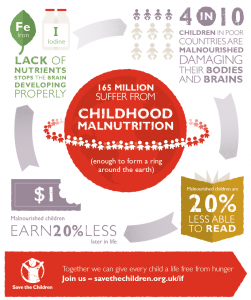 4/10 children in poorer countries are so badly nourished that they have difficulty reading. A lack of nutrients in these children is stopping their bodies and brains from developing properly. Of course, the issue of whether to feed a five year old chocolately cereal for breakfast is nothing compared to malnutrition on this scale, but the results are similar, to my mind. Both sets of children have difficulty concentrating, both sets feel lethargic, both sets of bodies need good quality nutrition to be able to grow, develop and thrive. Without it, we are wasting goodness knows how many lives and how much talent. The future of the world depends upon feeding our children. “Missing out on a nutritious diet can severely damage a child’s ability to read and write simple sentences and answer basic maths questions correctly, our new report, Food for Thought, reveals. On average, these children are 20% less literate than their peers – regardless of the amount and quality of schooling the child receives” (Save the Children). “These children could earn up to 20 per cent less in adulthood, while our findings suggest that hunger could cost the global economy £82 billion a year” (Save the Children). It’s so sad that we live in countries with good, nutritious food easily available and choose to feed our children processed junk. And we eat it ourselves, too. I agree that there’s nothing wrong with treats for special occasions or on weekends and eating fast food and sugary cereal is probably still better the nutrition than children of extreme poverty get – but we have choices and we ought to take advantage of those choices. Zazzy, the way I read it, we’re all poorly nourished, some from too little food, some from poor quality food. And none of us can function properly that way. You are right, we have more choice than those poor souls do, but it seems that we still suffer for it, just in a different way. Childhood nutrition seems like a no-brainer. But getting enough food/the right food to kids seems insurmountable. I have no idea about how to make it happen, but agree with you that it needs to happen. Soon. Ali, my son really likes fruit / veg / salad / healthy stuff but it’s the influence of his friends and advertising now that he’s 5, at school and can read, which are changing things. I may be way off the mark, but it sometimes seems to me that kids are given x, y, z, because “that’s what kids eat”, and it doesn’t occur to people that they might like more healthy stuff. It’s almost received wisdom that they won’t like it. For example, we were out as a family at a restaurant and my husband and son ordered lasagne and chips and mussels and salad. Guess which combo got put in front of my son! The waiter nearly fell over when he saw my son eating mussels and salad, the proper way using the shell. Of course, this is so very different from not having enough food, but this is the thing I know most about at the moment. Thanks so much for posting and raising awareness on behalf of myself and Save the Children. Love how you point out that the future depends on good nutrition for all. Thanks Kate, and thanks so much for tweeting the link, too. It’s something I feel quite strongly about and feel that more people should take it seriously too, both in the developed world and poorer countries. Thanks for giving it a prominent platform at Britmums. This post makes me realise how much – pardon the pun – we have on our plate in the West. But then there are many impoverished families in this country etc too. This makes it all the more sickening that the West has enough money and reserves to cancel world debt, and there fore help end poverty and malnutrition in children. Thanks for commenting OM, you are absolutely right. It’s amazing that there are children in this country too relying on food banks and going to school hungry. I’m sure it’s affecting all our futures. Thanks Anya! It was big in the news for one day, then seems to have disappeared, but it seems so important. So sorry you are having trouble getting these posts. 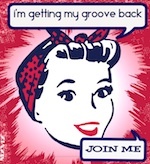 Could I suggest, if you want to, to try resubscribing using the button on the blog? I’ll get my hubby to see if he can add you too, that’s a bit beyond me, I’m afraid. Hope you are having a good week.